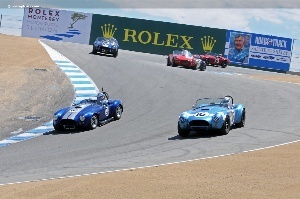 The 2012 edition of the Rolex Monterey Motorsports Reunion featured a field of over 550 historic race cars divided into 17 race groups. This year's feature celebrated Historic Stock Cars and the 50th anniversary of the Shelby Cobra. In honor of the anniversary and the late Carroll Shelby, a group of 45 Shelby Cobras that once competed in the 1960s raced around Mazda Raceway's Laguna Seca 11-turn track. The tribute race was to honor the Cobra's originator Carroll Shelby, who had planned on attending the event, but, sadly, died in May of this year at the age of 89. The wave of the green flag was performed by celebrity starter Edsel Ford II. When the checkered flag dropped signaling the end of the race, it was Jim Click in his 1964 Cobra 289 in the lead followed by Lorne Leibel and James Farley in their 289 Cobras. After the race, Jim Click said 'I knew Carroll Shelby; he did so much for racing and for Ford, so it is an honor for me to have won this race for Mr. Shelby. This is the biggest win of my life.' Click started third on the grid, but the second-place car broke down, leaving a 1964 Cobra 289 for the lead. 'I was chasing car #81 (also a 1964 Cobra 289) for the lead, and I knew I was faster going through the turns; he is a really good driver, but he finally made a bit of a mistake exiting a corner, so I was there to take advantage,' said Click. Along with the celebration on the track, hundreds of Shelby Cobras were on display in the paddock, surrounding corrals, and even in the museum-quality Heritage Display. Inside the Heritage Display as Cobra serial number CSX20001, the very first production built, among its 12 historically Cobras that helped map the heritage of the iconic marque. Prior to the start of the race, 169 Cobras thrilled the crowds with yet another thunderous salute to Carroll Shelby in 'Parade Laps' that converged 50 original Shelby Cobras (2000s and 3000s) with 25 continuations (4000s and 6000s that were built by Shelby American with Carroll Shelby's blessing 20 years after the originals), 19 replicas of the Cobra Daytona Coupe (the lead car of which the Coupe's designer Peter Brock had command) and 75 more Cobra replicas. Ever since opening in 1957, Laguna Seca has played host to just about every known type of motor racing series. It would even welcome Formula One cars from time to time trying to tame this 'Dry Lake'. It is fitting then that this circuit, with its wide and varied clientele would come to host such historic racing. As usual, Monterey would welcome other classes of cars that weren't to be missed. Adding to the diversity, this year's entry list included modern Formula Atlantics race cars. To make room for the Stock Car and Formula Atlantic group, the popular 1970s Formula 1 and Can-Am group were missing - perhaps to be adding back into the rotation for 2013. As in years past, the Rolex Monterey Motorsports Reunion was filled with legendary cars, personalities and events. It offered something for everybody and delighted all of the senses.